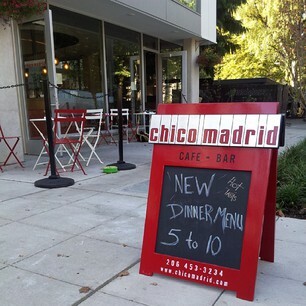 Welcome to the taste of Spain right here, in Seattle, Washington at Chico Madrid Restaurant. I’ve been lucky to visit Spain twice – once in Madrid and once in Barcelona. I still remember the crowded, lively restaurants, where you are seated close enough to your neighbors to hear their conversations (and understand them if you are fluent in Spanish). The hustle and bustle of the servers, small plates coming and going, pitchers of sangria getting empty and refilled…delicious memories! I have been looking to relive these memories of Spain here at home, in Seattle and came close to it today. My friend Lera and I headed to Chico Madrid for our girls’ night and discovered quite a few tasty bites. Welcome! The happy hour offered $1 discount on sangria (red and wine), a mixed drink of red wine and coke or soda, and Spanish beer. Our server was kind enough to bring out a taste of both red and white sangria, as well as two varieties of red we were considering. 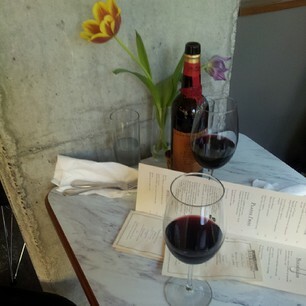 We decided on the $18 bottle of Don Ramón 2012 Grenache/Tempranillo from Spain. To start, we ordered a plate of olives and Serrano ham. Interestingly enough, the olives were actually from Italy. Nevertheless, they were delicious, slightly smoky with a hint of chocolate. The ham, thinly sliced and drizzled with olive oil melted in the mouth. The ham came with slices of toasted bread that I believe were lightly rubbed with garlic. Next, we tried Spanish meatballs and roasted vegetables with Romesco sauce. Unfortunately, the meatballs were a miss ~ tough and bland. The vegetables, however, were well seasoned and reminded me of a popular Russian “caviar” dish – a combination of eggplant, pepper and tomatoes. We couldn’t pass on the order of Tortilla Española: Spanish omelette with potatoes, onion and aioli. My preference is to have the tortilla served slightly cold. This version came sliced into four pieces, garnished with piquillo peppers and anchovies, served cold. The aioli could definitely use a bit more garlic and salt. This was one delicious sandwich! Crusty baguette from Columbia City Bakery was rubbed with tomatoes and layered with thinly sliced chorizo and generous slices of garrotxa cheese. I’d love this some day for breakfast or for lunch with lightly dressed arugula salad. And we didn’t stop there! (Perhaps I should mention that Lera’s friend joined us for dinner, so we were sharing this between three people). We decided to order Piquillo Peppers Stuffed with Braised Beef Short Ribs. This dish screamed autumn and winter. Hearty, filling, rich and warm. Forget having this as a tapas – served atop cheesy polenta, this would make an incredible meal. And then it was time for dessert. A coffee for me, a glass of Cava for Lera (some things never change). We shared a chocolate-stuffed crepe and De Valdéon blue cheese with Ballard honey. We should have skipped the crepe and ordered a double amount of the cheese. The cheese was creamy, smooth and I’m sure went really well with honey (I skipped the honey and enjoyed the bread and cheese as they were). We might be back one day. I am hoping to see new items appear on the menu – perhaps more vegetables in simple preparation and a variety of olives along with a few seafood tapas.